One notable improvement to a drab environment can be the addition of a bright and elegant glass tile backsplash that accents an otherwise boring room. Backsplashes usually only cover a small section of a wall adjacent to a sink, yet a colorful or highlighted pattern instantly attracts the eye when entering the room. Even a small band of colorful glass tiles can transform the environment into a brighter more interesting setting. Why are Glass Tiles Best for Backsplashes? 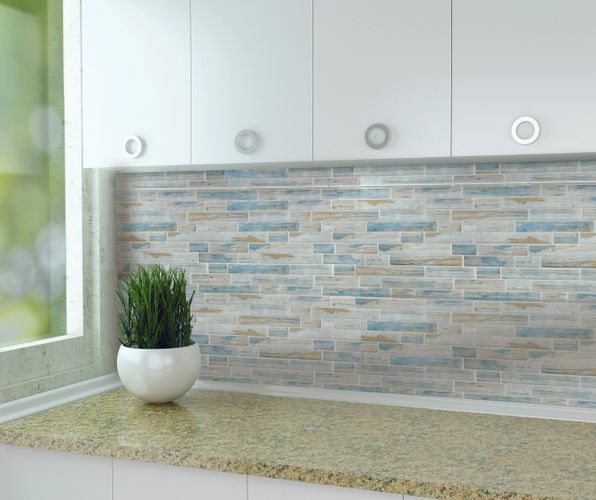 Mosaic glass tile backsplashes add a brilliance that stone and ceramic tile cannot. Available in a wide range of colors and patterns from PetraSlate Stone & Tile of Denver, glass tiles can absorb and reflect light to create an ever-changing accent in the room as the lighting changes throughout the day. Besides the inherent brilliance, mosaic glass tile backsplashes are naturally easier to clean and maintain. Genuine or manufactured stone tiles, while stunning in their own right, require additional maintenance to keep stay stain-free from exposure to water, soap. detergents, and other compounds that may splash up from the sink. Water-resistant glass tiles only need a thorough wipe to remove the moisture, never staining. Glass tile backsplashes stay looking new for decades. Homeowners and builders may choose any style, pattern, finish, and color of mosaic glass tile they might imagine for their backsplashes. Easy to install, the material is mounted on 12” x 12” mesh sheets. Colors range from nearly pure white to shades of red, auburn, cinnamon, blue, and gray to glossy black. Some styles incorporate a mixture of colors and degrees of reflectivity to create truly unique and attractive patterns. Shapes of the individual mosaics can be square, retangular, diamond, and even hexagonal to match the homeowner’s preferences. The degree of reflectivity in the material will define the brilliance of the material. And, tiles range from small 1” x 1” square mosaic pieces to larger and more irregular shapes. To understand more about and compare the 136 different glass tile products designed specifically for backsplashes, contact PetraSlate Tile & Stone. You may see the entire range of high-quality mosaic glass tile products on their website. Or, you may phone the cladding experts at PetraSlate for more information about the purchase and installation of top-quality, long-lasting glass tile backsplashes at (303)-280-9595.